True pizza lovers know where to get the perfect pizza pie. If they told you there was a better pizza joint than here, it would most definitely be a lie. 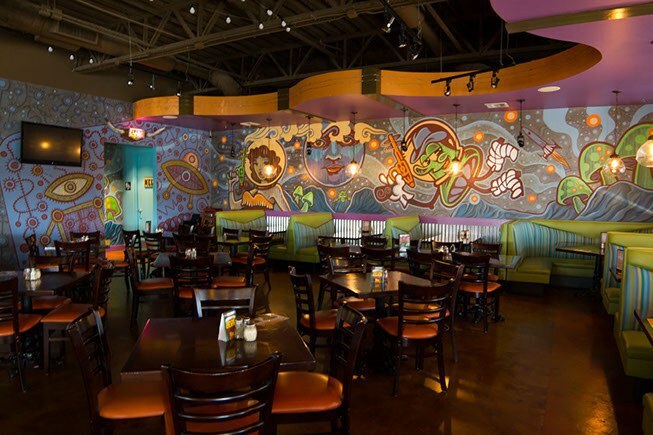 Mellow Mushroom is the place to go, and make sure you arrive hungry. When you walk through the front doors of the restaurant, you are greeted with crazy wall art. The ambience has almost a “hippie” vibe; the use of tie-dye is off the charts! The light fixtures are wavy and add to the groovy feel. These along with other free spirit decorations magnify the customers’ zeal. and are overwhelmed with the number of options, you're not sure what to do! You decide to start with an appetizer, but which one will you choose? How about settle on the pretzels, what have you got to lose? The pretzels are cooked to perfection and can be served in three different styles. Whether you choose garlic butter and parmesan, butter and kosher salt, or cinnamon sugar and honey, you will be eating those pretzels with a smile. The dipping sauces include mustard or red sauce, either one is a good selection. While eating your pretzels, you might as well glance over the entrée section. But you’re at a joint known for their mouthwatering pizzas, you can even confirm this truth by checking Yelp on your phone. But if you’re a potato lover like me, the “Red Skin Potato Pie” is the ultimate pizza dream. Applewood smoked bacon, caramelized onions, cheddar, and mozzarella cheese. The pizza is then garnished with chives and drizzled with spicy ranch dressing and sour cream. Your first bite will have you running to hug the entire Mellow Mushroom team. And then there’s the crust, many customers’ favorite part of the pie. You will not want to leave the restaurant without giving the crust a try. The doughy crust is brushed with garlic butter and covered with cornmeal and parmesan right before serving. It may not be the healthiest of crusts, but I’m sure you are deserving. Oh, Mellow Mushroom, don’t ever change. The slightest alteration in your perfection would just be too strange. If you hold onto your groovy vibes, you will always attract many guests. Well, thank you, Mellow Mushroom, for being the best.